An away win in the first leg of a cup semi-final is always a great result, and if it also means scoring twice against none other than Atlético Madrid (see the goals again) then the news just gets better. In fact, after winning 2-1 on the road in the first act of a Spanish Cup tie, Barça have only once failed to go to the next round. That was case, for instance, last season when Barça won by that score at Athletic Club and went on to finish the job with a 3-1 win at the Camp Nou, and also in the quarter finals of 2011/12, when a 2.1 win against Real Madrid at the Bernabéu was followed by a 2-2 draw at home. For Atlético Madrid, meanwhile, this was the sixth time they’ve lost a first leg 2-1 at home and it’s not a result that has tended to do them much good. Only once, in 1977-78, did they manage to turn the tie around and qualify at the expense of Athletic Club. Leo Messi rises to the occasion. With his terrific left-footer in the semi-final, he’s now scored 12 times at the Calderón. The only place where he has matched that away record is the Bernabéu. Luis Suárez early doors. Amazingly, Atlético had gone 32 games in all competitions this season without conceding a single goal in the first 15 minutes. That record has finally been ended. Playing away to Atlético Madrid is one of the toughest jobs in football, but it’s a fixture that Luis Enrique has already won four times as Barça boss (Liga 14/15, Copa 14/15, Liga 15/16 and Copa 16/17). Messi (who has now racked up a career total of 26 goals against Atlético) and Luis Suárez have both already scored an impressive seven goals in what has gone of 2017. Messi was also the Barça player who won the third highest number of balls, six, topped only by Jordi Alba (11) and Samuel Umtiti (9). Jasper Cillessen made more completed passes (36) than every member of the home team bar Koke (42) and Gabi (45). Not only that, but 14 of those passes were long balls, one of which began the move that led to the second goal. That was the first time that Luis Suárez has scored at the Calderón. All four of his previous goals against the mattress-makers had come at the Camp Nou. And the story of Barça never losing if Suárez scores has been extended to an impressive 68 games. Messi scored his 30th goal of the season (15 in La Liga, 10 in the Champions League, 4 in the Copa del Rey and one in the Super Cup) and is the team’s joint top scorer in the competition, with the same number of four shared with Arda Turan. 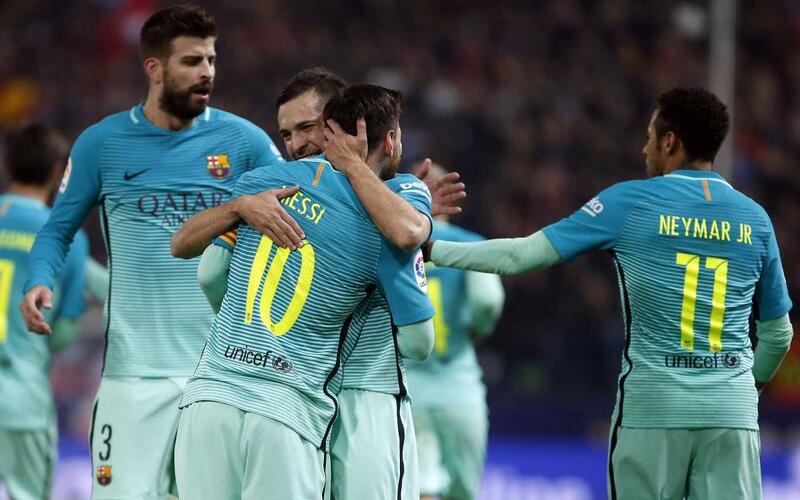 FC Barcelona have won 71 Spanish Cup first legs away from home throughout their history. And on a massive 70 of those occasions, they have gone on to qualify for the next round. Neymar Jr picked up a third cup yellow card of the season and will be suspended for the second leg on Tuesday. Atlético’s Gabi will also have to sit that one out. Umtiti, Jordi Alba and Messi are all on two yellows, which means that if any of them are booked next week, they’d miss the final should Barça qualify.